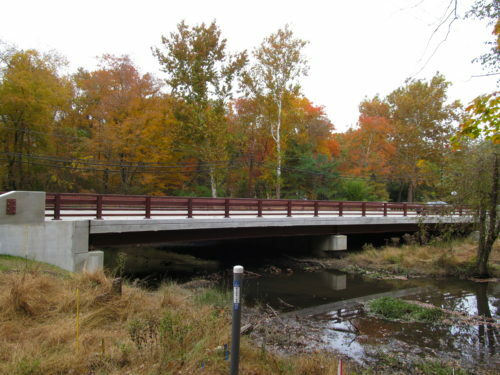 JMT’s work on the Replacement of Cranbury Road Bridge over Bear Brook project recently won Project of the Year from the Mercer County Chapter of the New Jersey Society of Professional Engineers (NJSPE). Cranbury Road Bridge, in West Windsor Township, NJ, was a four-span, simply supported prestressed voided slab bridge that had scour issues. JMT designed a two-span replacement that moved the pier out of the stream and into the floodplain where it will not be subject to flow. The two-span, continuous curved steel girder is supported on pile-supported convention abutments and piers. Our services on this project included structural design, hydrology and hydraulics, scour and drainage design, environmental permitting, cultural resources, constructability analysis, utilities relocation, roadway design and detour, and community involvement.